TI's latest graphing handheld with a powerful Computer Algebra System that enables a deeper understanding of abstract concepts in math and science subjects. 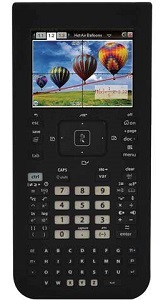 This is TI's latest graphing handheld with a powerful Computer Algebra System that enables a deeper understanding of abstract concepts in math and science subjects. The TI-Nspire CX CAS provides algebraic capability to symbolically solve equations, factor and expand variable expressions, complete the square, find antiderivatives, computer limits and exact solutions in irrational forms, making it a robust hands-learning tool that satisfies math and science curriculum needs from middle school through college. Standardized testing organizations have approved the TI-Nspire CX CAS handheld for SAT, PSAT/NMSQT, AP and Praxis high-stakes exams. It is also approved for some state exams.